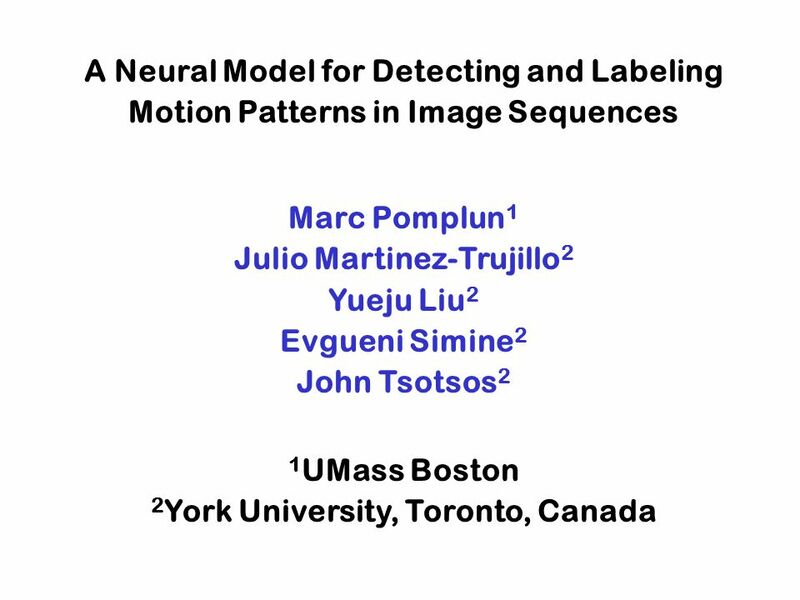 A Neural Model for Detecting and Labeling Motion Patterns in Image Sequences Marc Pomplun 1 Julio Martinez-Trujillo 2 Yueju Liu 2 Evgueni Simine 2 John. 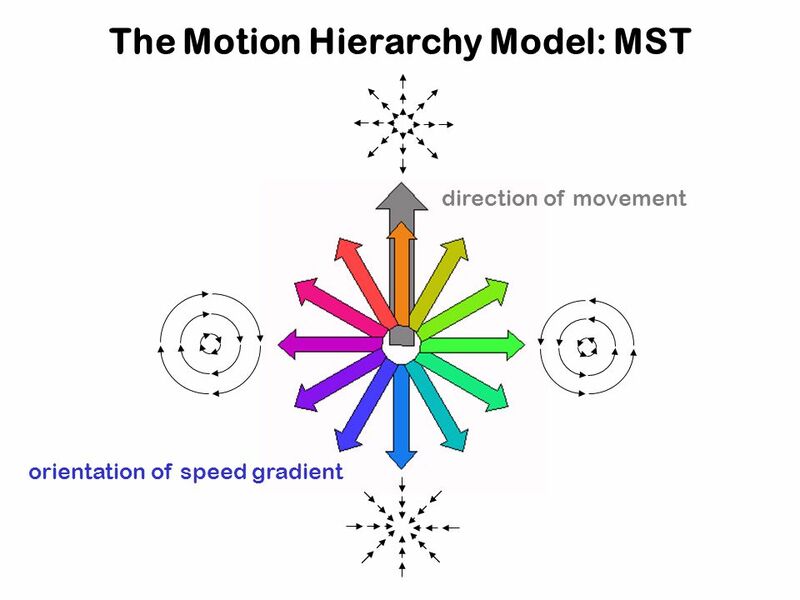 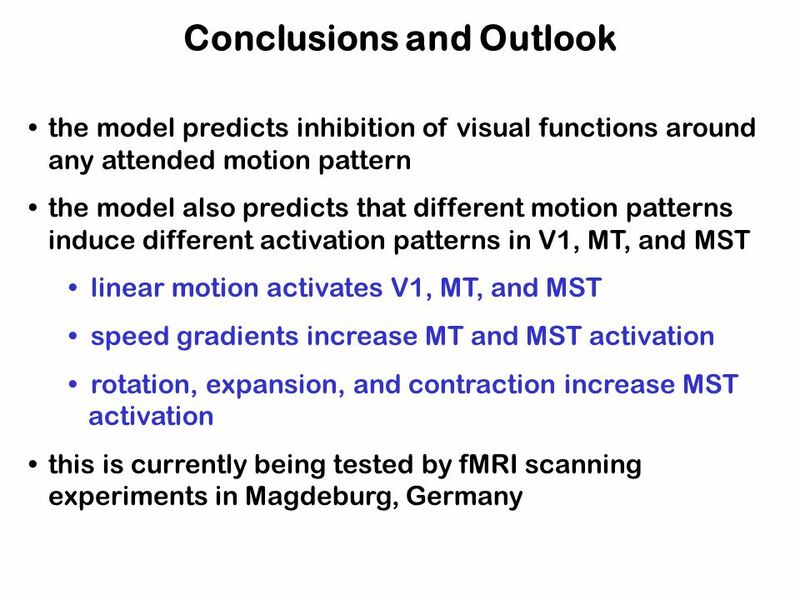 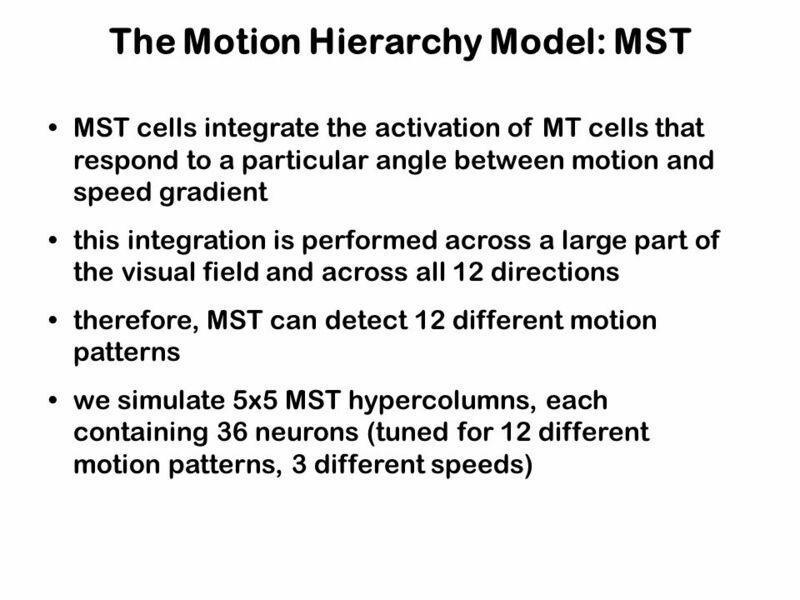 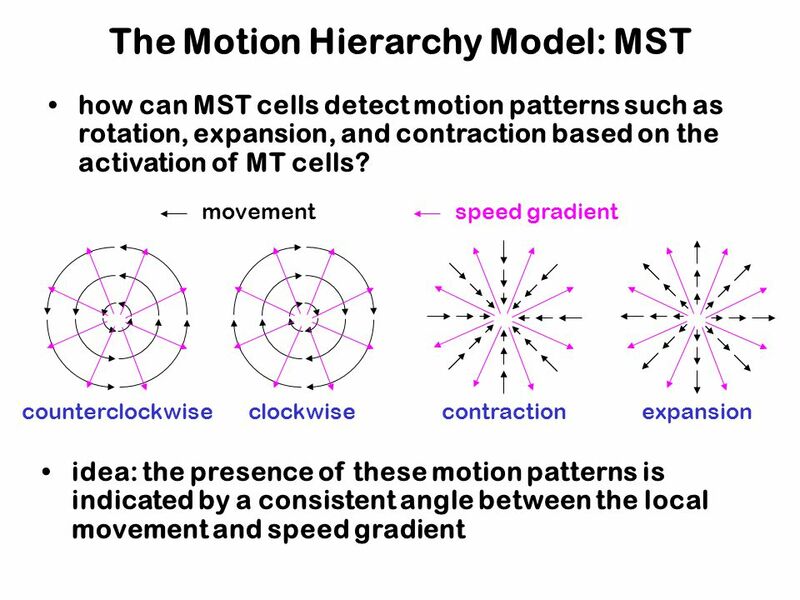 24 Attention in the Motion Hierarchy What happens if there are multiple motion patterns in the visual input? 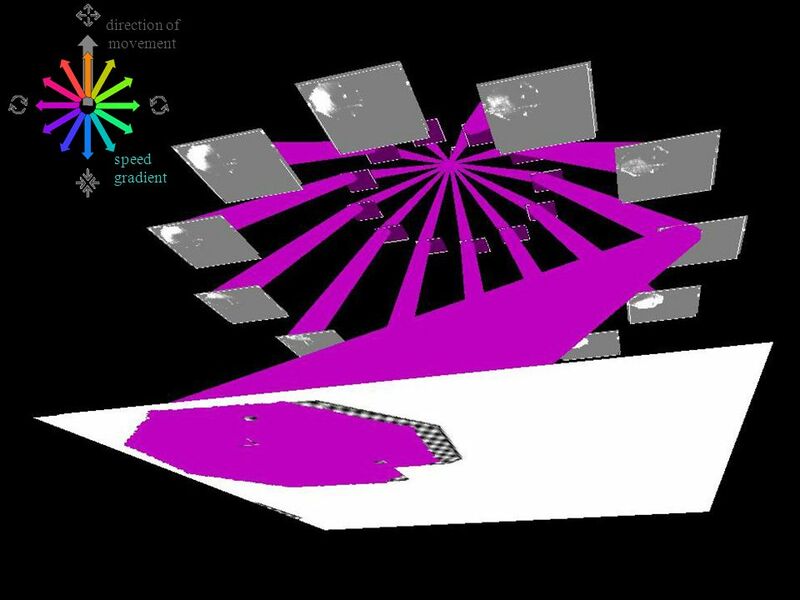 Visual attention can be used to determine the type and location of the most salient motion pattern, focus on it by eliminating all interfering information, sequentially inspect all objects in the visual field. 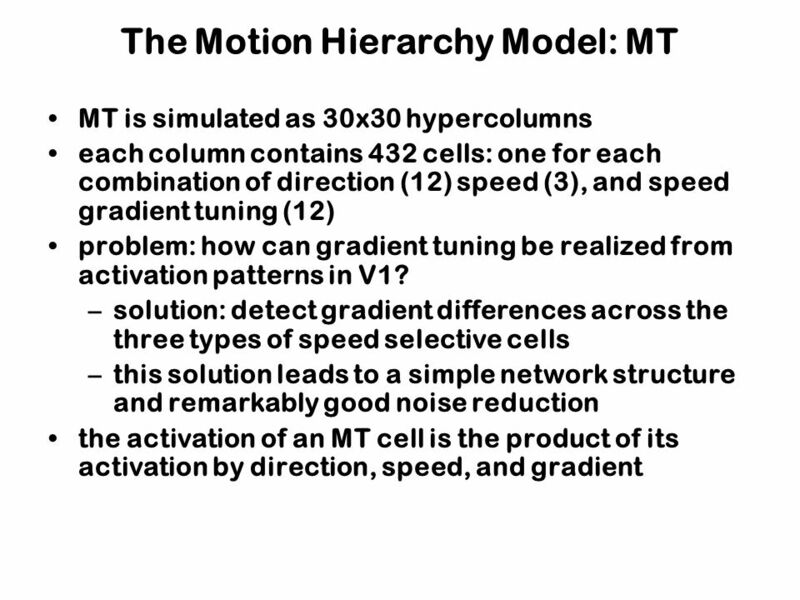 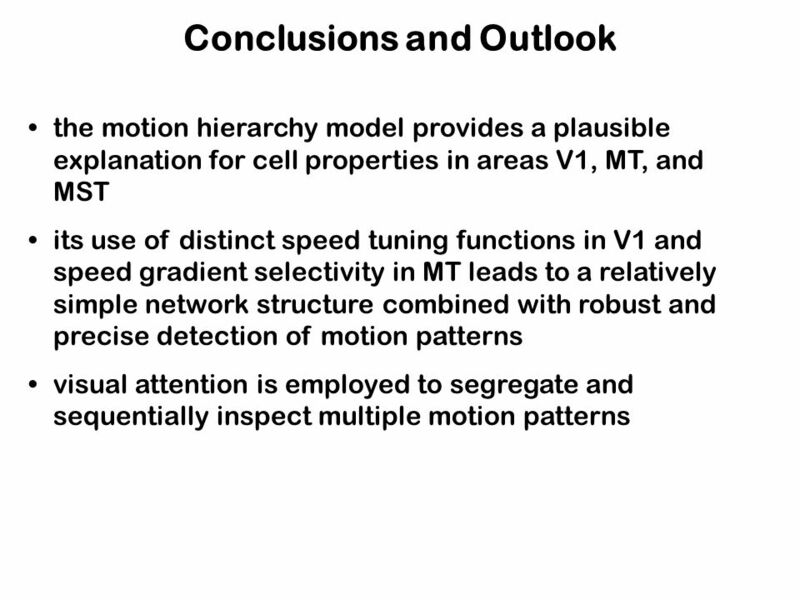 Download ppt "A Neural Model for Detecting and Labeling Motion Patterns in Image Sequences Marc Pomplun 1 Julio Martinez-Trujillo 2 Yueju Liu 2 Evgueni Simine 2 John." 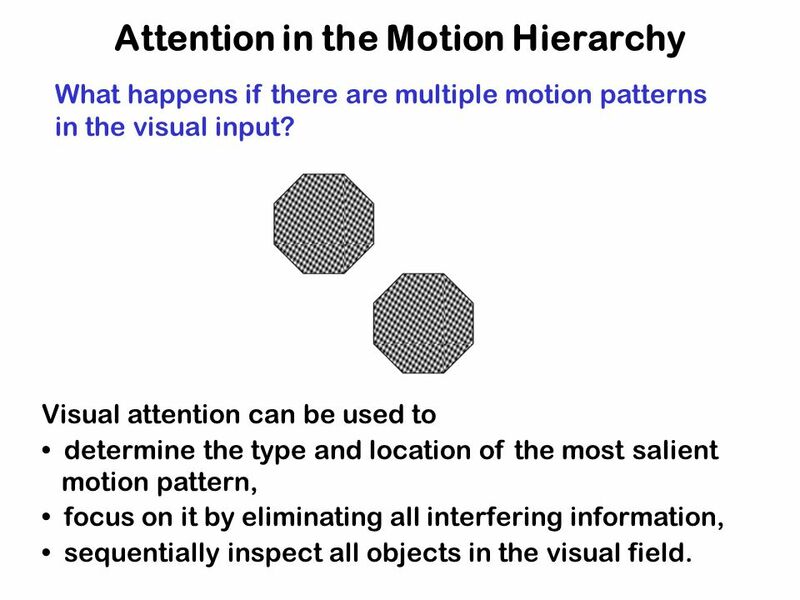 September 2, 2014Computer Vision Lecture 1: Human Vision 1 Welcome to CS 675 – Computer Vision Fall 2014 Instructor: Marc Pomplun Instructor: Marc Pomplun. 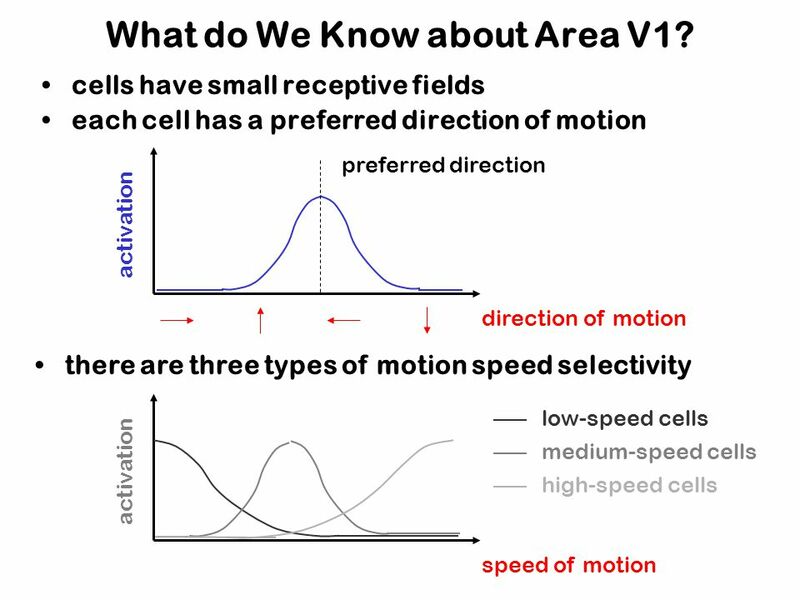 Visual Neuron Responses This conceptualization of the visual system was “static” - it did not take into account the possibility that visual cells might. 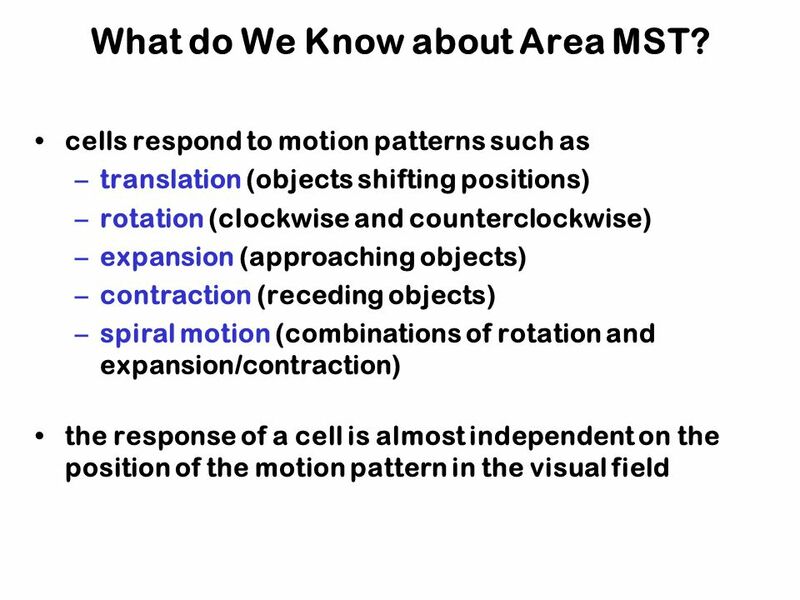 Question Examples If you were a neurosurgeon and you needed to take out part of the cortex of a patient, which technique would you use to identify the. 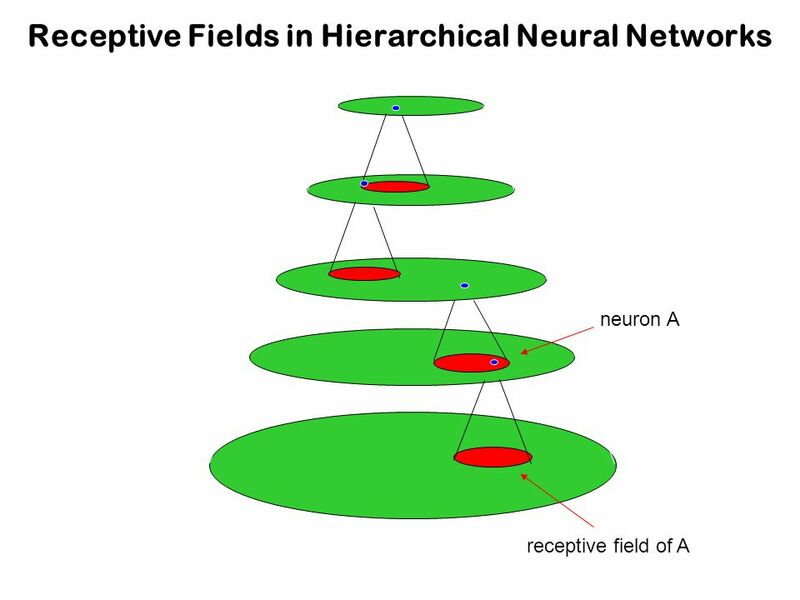 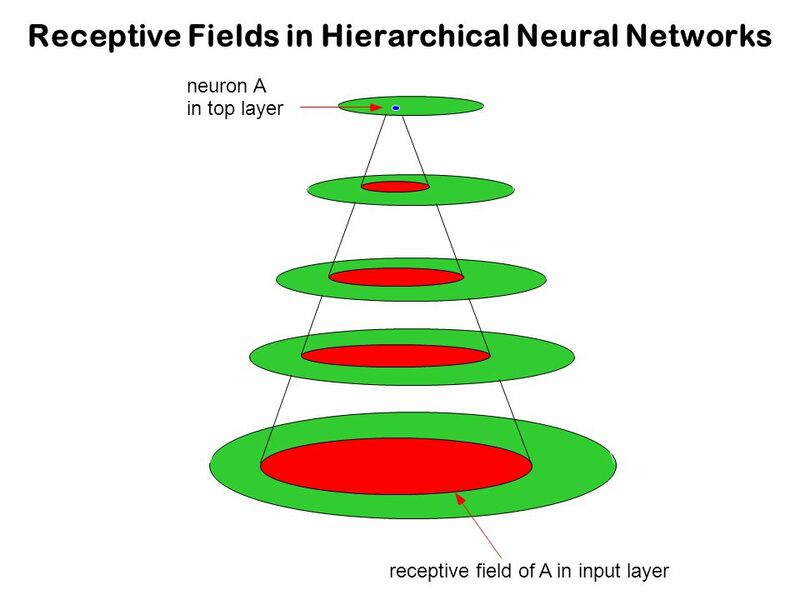 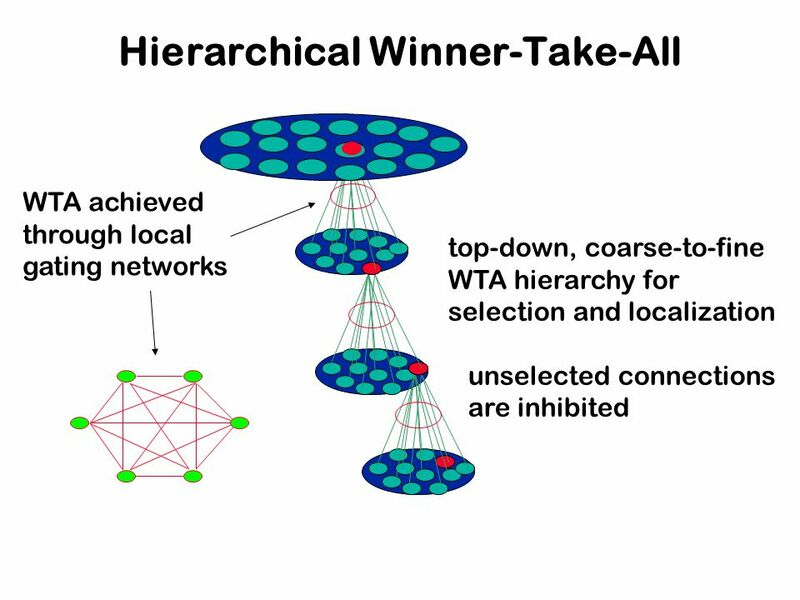 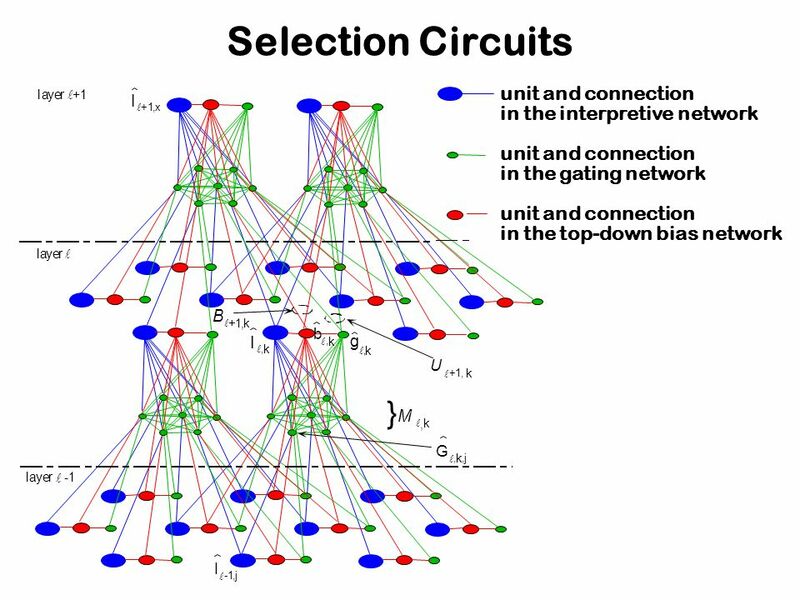 1 Biological Neural Networks Example: The Visual System. 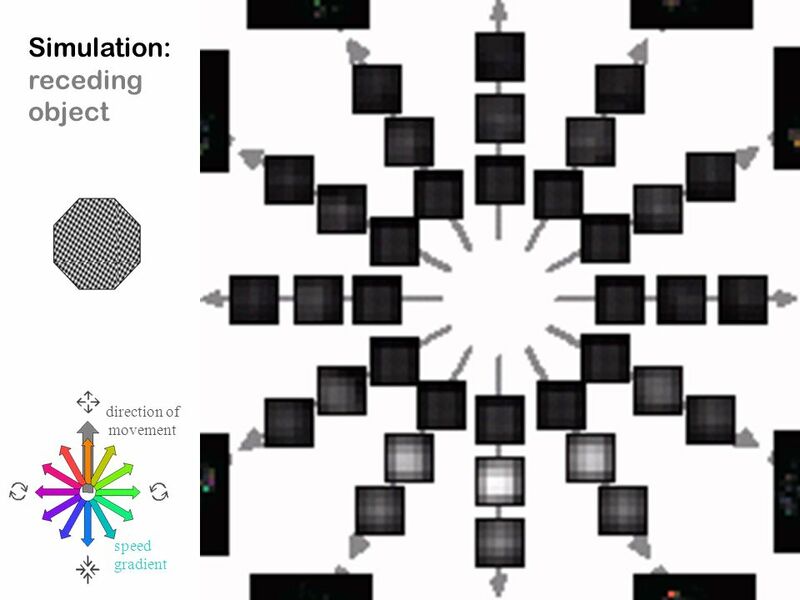 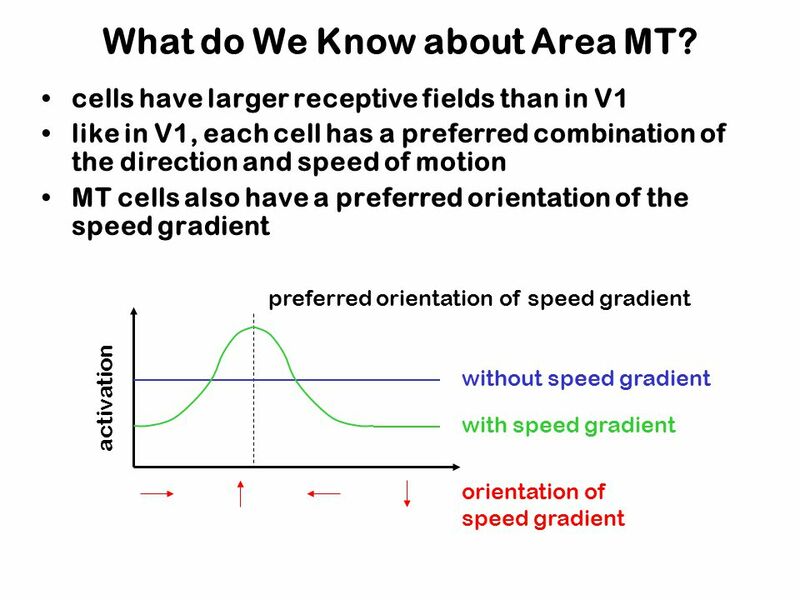 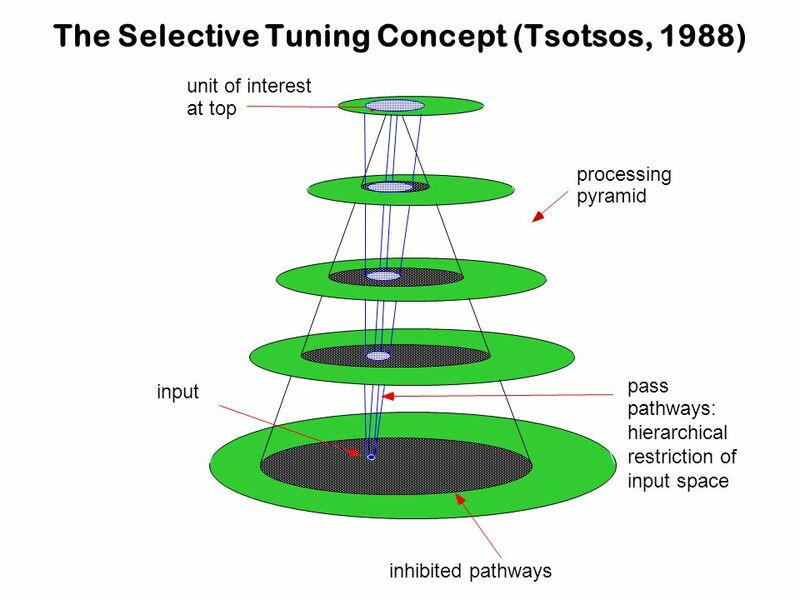 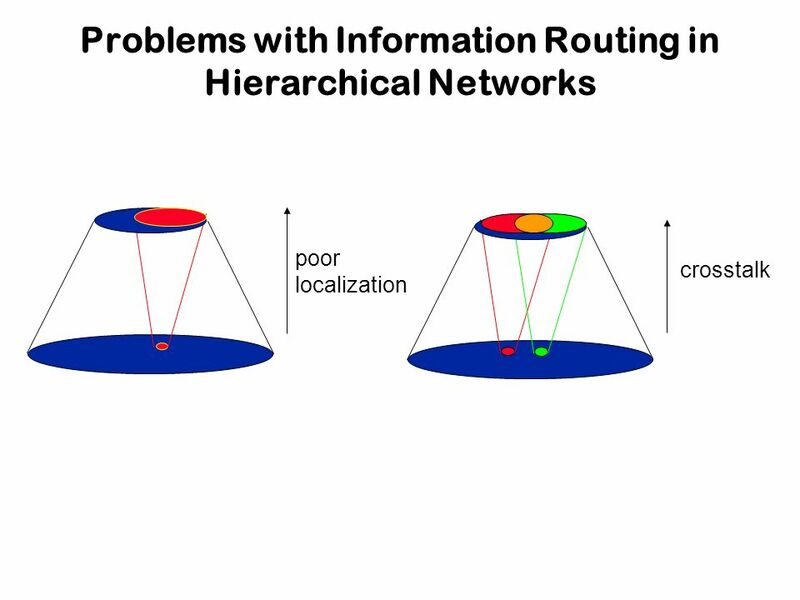 How does the visual system represent visual information? 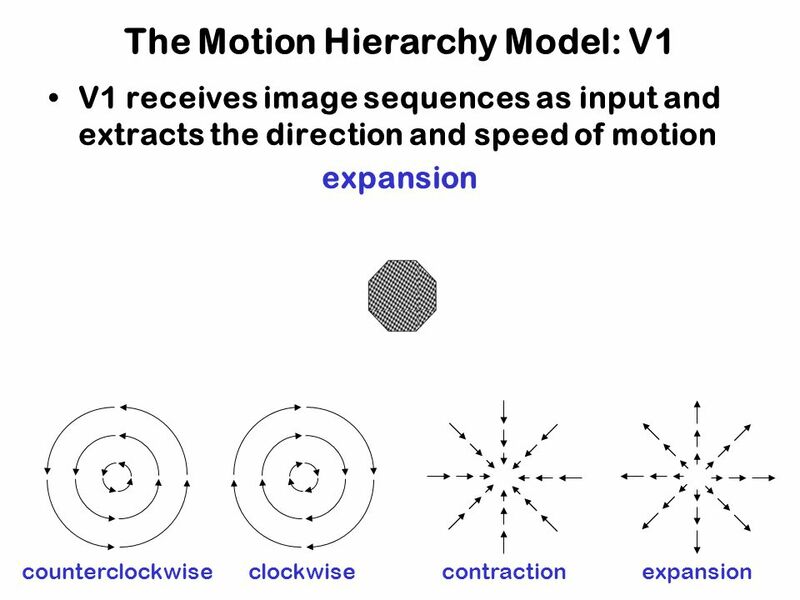 How does the visual system represent features of scenes? 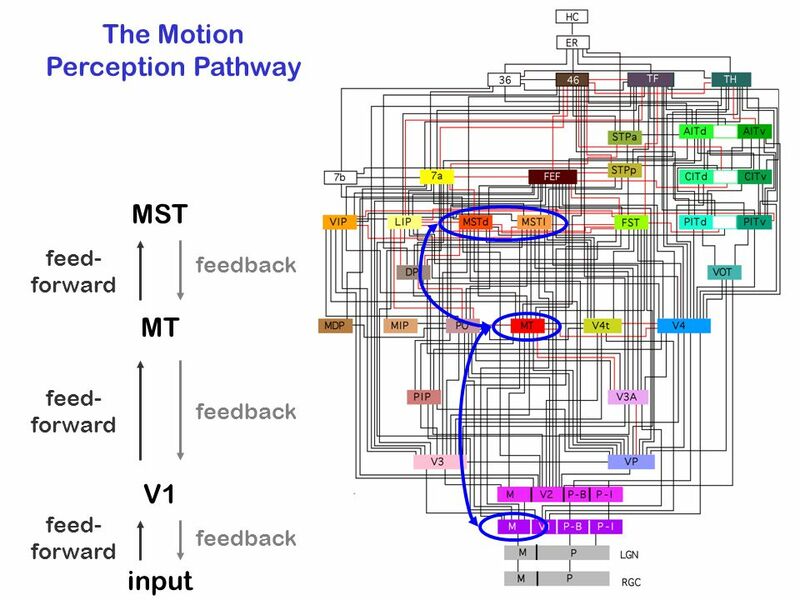 Vision is analytical - the system breaks. 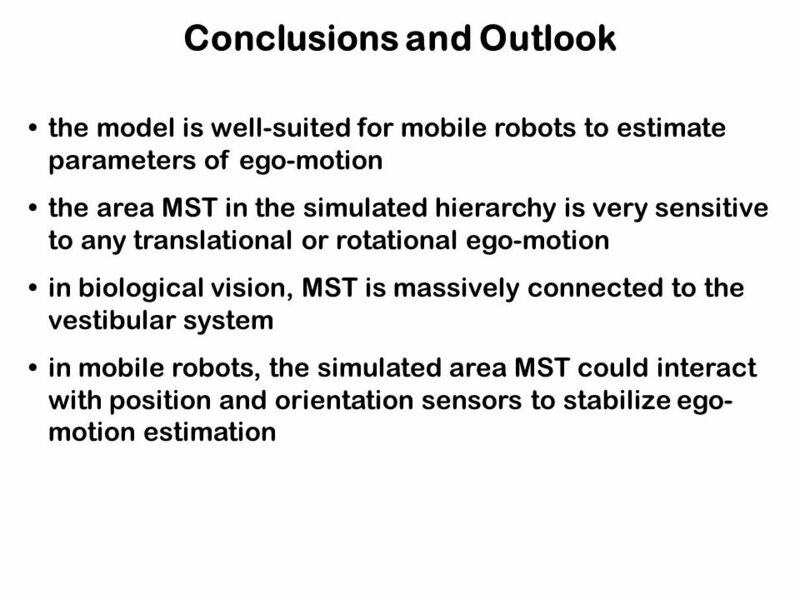 Introduction to Cognitive Science Lecture 2: Vision in Humans and Machines 1 Vision in Humans and Machines September 10, 2009. 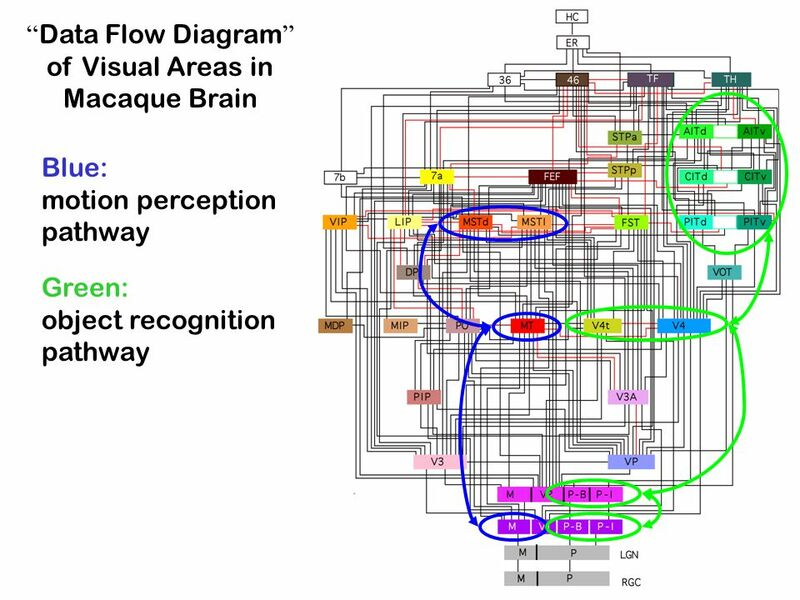 EE141 1 Broca’s area Pars opercularis Motor cortexSomatosensory cortex Sensory associative cortex Primary Auditory cortex Wernicke’s area Visual associative. 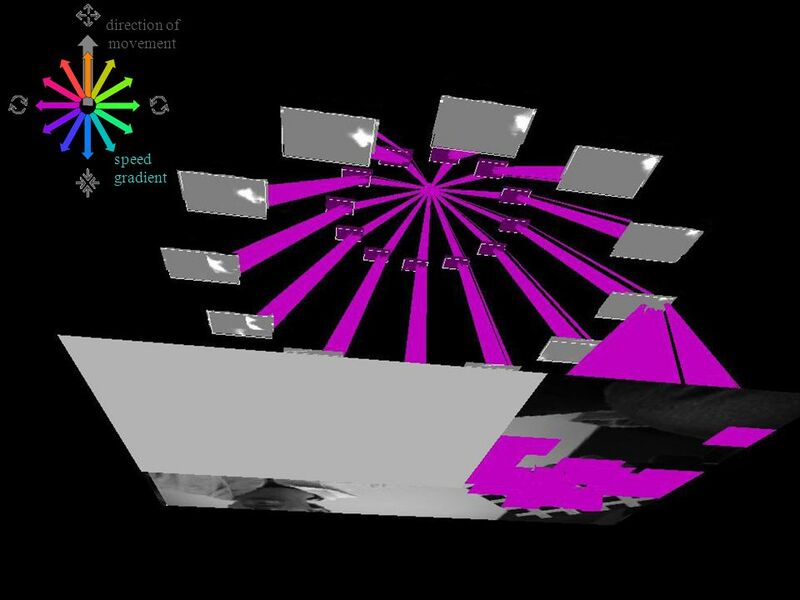 Edge Detection Lecture 2: Edge Detection Jeremy Wyatt. 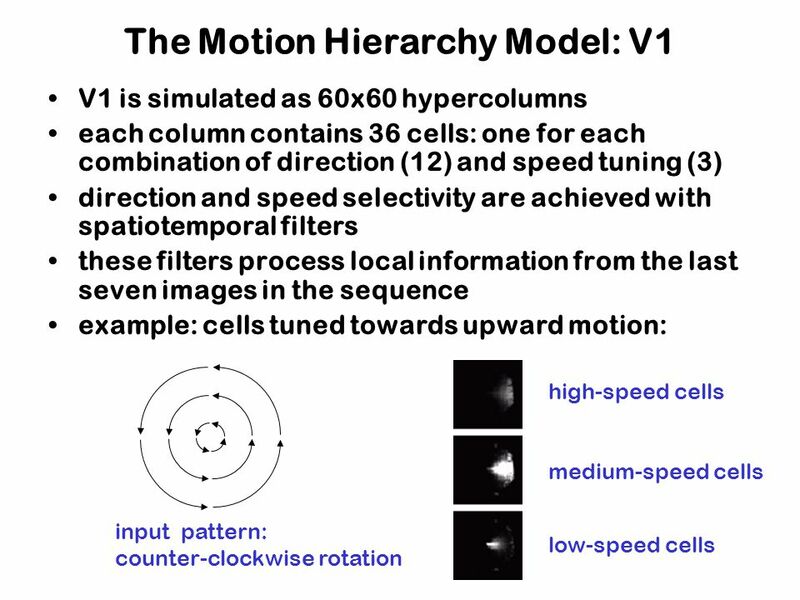 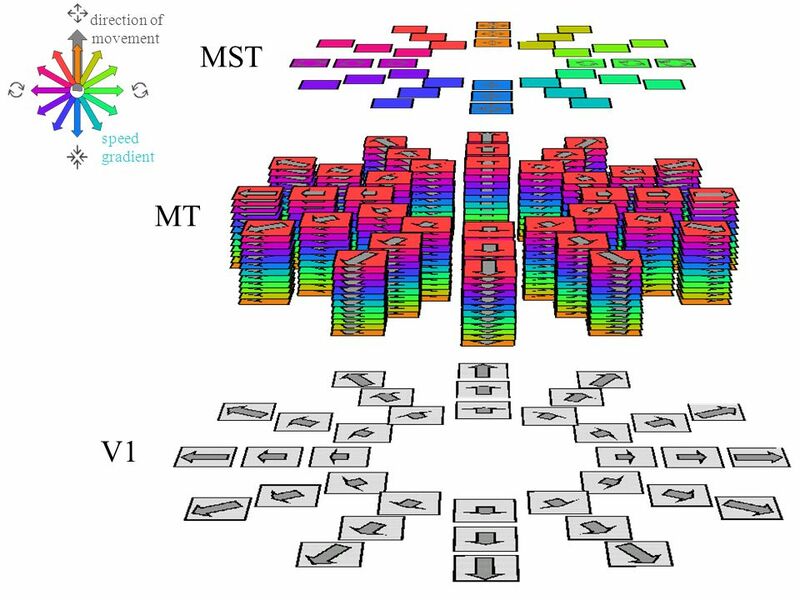 Laurent Itti: CS599 – Computational Architectures in Biological Vision, USC 2001. 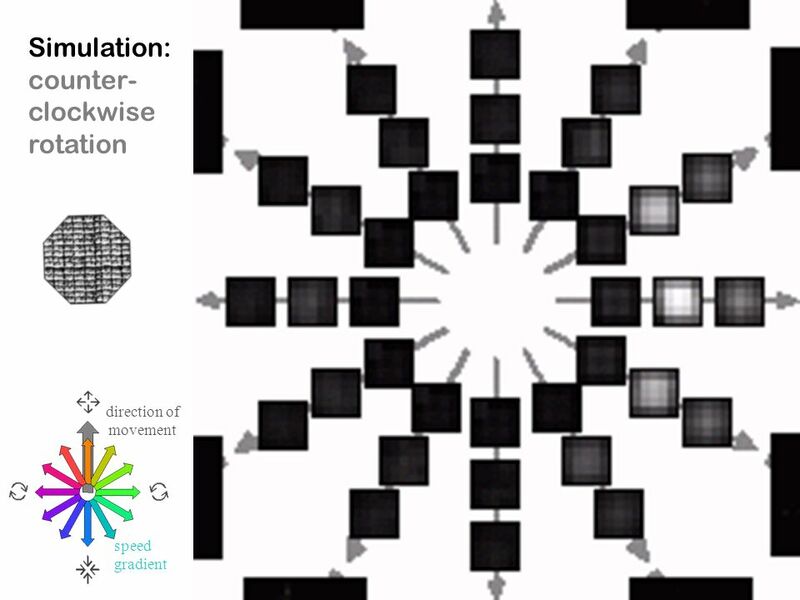 Lecture 12: Visual Attention 1 Computational Architectures in Biological.